Phone Master for the Panasonic TDA30 (PM30) is the latest project for PMc Software. If you have a TDA30 telephone system and would like to be included in the trial phase of PM30 then please contact us (email address below). Everyone involved in the trial gets a full working version of PM30 when it is finally released. People trialing Phone Master should be a least a little Computer Savvy and not afraid to experiment a little. To be able to set the Date and Time of your telephone system with just a couple of clicks ! If you have any ideas about you would like to see in Phone Master, then please do let us know ! As will all PMc Software products you are entitled to free upgrades to that product when they become available. So if you purchase the first release you are entitles to any future release at no charge. See the Whats New page for more info on this release. We are always working on VoiceMail Master, so if you have some suggestions please do let us know. TVS50, TVS75, TVS80, TVS90, TVS95, TVS100, TVS110, TVS120, TVS125, TVS200, TVS220, TVS225, TVS300, TVS320 or TVS325 ? Then proceed straight on to the downloadpage for the free trial package. Try it before you buy it risk free for 14 days ! What is VoiceMail Master ? VoiceMail Master is a fantastic piece of software thatallows the Panasonic Voice Mail owner to take control of yourVoice Mail quickly and easily. Time and date changes are simplified, along withediting of Mailboxes, Custom Service Menus, Notification Device Settings,Daylight Saving, Holiday Settings and System Working Reports that can beproduced to show your system setup at your convenience. 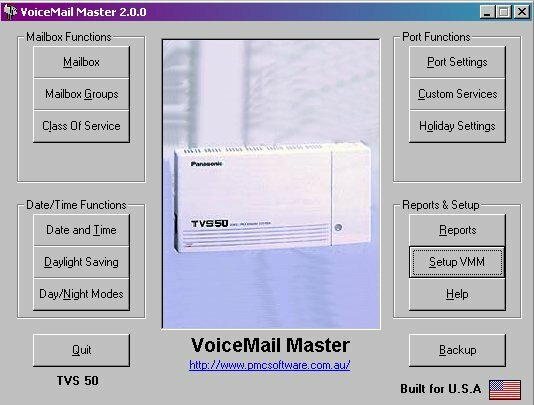 VoiceMail Master is designed to be connected directly from your PC serialcommunication port to your Panasonic Voice Mail System. And supports allof the following countries. USA, England (UK), Germany (GR), Italy (IT), France (FR), New Zealand (NZ), Singapore (SN), Australia (AL), Latin America (LA), Canada (CA), Unknown Country (BX) (TVP/TVS model shown in brackets). System requirements : Windows 95,98, NT, 2000, ME or XP. Serial Port and Crossover Cable. Looking to Register your copy of VoiceMail Master ? Go to theRegistration page. Get the VoiceMail Master Demosoftware to see what all the fuss is about. (3.5 Meg). There is comprehensive context sensitive windows help with VoiceMail Masterbut if you would like even more information check out the UserManual. Programator for for KX-TD1232, KX-TD816, KX-TD308 PBX now available from the download page ! Programmator allows you to configure your Telephone System and is an excellent companion to VoiceMail Master. New is Programator for Panasonic KX-TA Y581 and Y591 systems as well ! Check out our Frequently Asked Questionspage. If you have a question your answer may already be there. Also the What'sNew page may be of interest to those looking for information on the latestversion number, product upgrades and enhancements. Phone: +61 414 796 796 Normal Business hours EST Australia.